The County Comm - Marathon ETFR Emergency Task Force Radio is smaller than a pack of cigarettes, can tune in the world and even has an LED light source. This amazing radio tunes AM (520-1710 kHz), FM (76-109 MHz) and has two shortwave bands. Shortwave Band 1 tunes from 5.2-10.45 MHz to include the 49, 41 and 31 meter bands. Shortwave Band 2 tunes from 11.1-18.3 MHz to include the 25, 19 and 16 meter bands. Medium wave coverage is 520 to 1830 kHz and FM is 76-109 MHz. This radio also features a 12 hour format clock with radio wake up alarm. The buttons to set the clock are on the rear panel. This radio requires 3 - 4.5 VDC or two AA cells (not supplied). 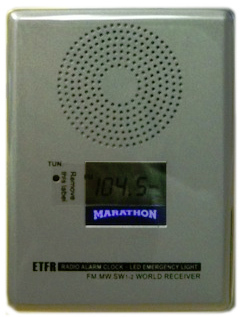 This radio is quite battery-efficient providing up to 150 hours at 40% volume or 70 hours of illumination. This radio also features a built in bright LED. Here is an inexpensive, yet capable radio that is just right for your emergency kit or on-the-go listening. The ETFR is similar to the earlier GP-4L, but was produced initially for Canadian Forces and features enhanced cold weather operation. The ETFR comes with 3.5mm earphone and English/French Owner's Manual. 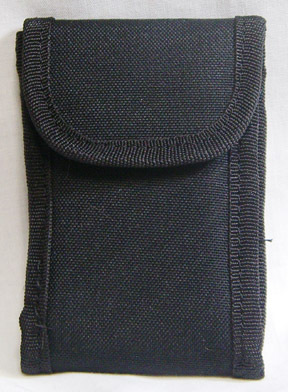 Only 2.55 x 3.5 x 0.9 inches (65x87x21mm).